and Typist-Copyist. Total 46 Court Jobs vacancies available in District Sessions Court of Shivamogga. Application forms will be accepted through Shivamogga District Court E Court website of https://districts.ecourts.gov.in/shivamogga/online-recruitment. Last date for submission of application form online is 18-01-2019. Selection for the recruitment of Shivamogga District Court will be through written exam or skill test and/or personal interview. 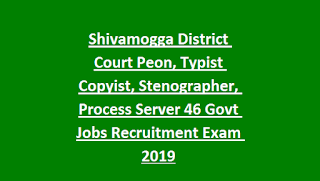 More information about Typist-Copyist, Stenographer, Peon, Process Server and Typist jobs of Shivamogga District Court Jobs Recruitment 2018 are given below. 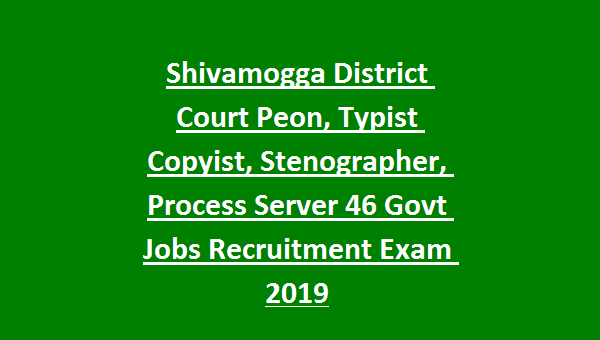 There are total 46 Court jobs vacancies in this Shivamogga District Sessions Court Recruitment 2019. Lower age limit for all the posts is 18 Years. For Peon-8th pass and should be able to read and write the Kannada language. For Stenographer-SSLC and Senior Grade Shorthand and typewriting examinations in both English and Kannada Language. Candidates can pay fee online or offline using SBI bank chalan. Selection for this Shivamogga District & Sessions Court jobs will be through personal interview. Eligible and interested candidates can submit their application form online using official website of http://ecourts.gov.in/bengaluru-rural/online-recruitment. Last date for submission of application form online is 18-01-2019. It is mandatory to provide valid email id and mobile number at the time of online application form. Information or any updates regarding Shivamogga District Court Jobs Recruitment will be send through SMS and Email Formats only. Upload latest passport size photo and signature scanned copies as pre the given sizes.